Products - Denver Dab Co. | Live Resin, Shatter, Sugar Wax, Wax — Denver Dab Co.
At Denver Dab Company we specialize in creating clean, high quality cannabis concentrates. We use a variety of pure hydrocarbon mixes (n-butane and instrument grade propane) to extract the resinous concentrated oil or "hash oil" from raw, dried cannabis plants. We then purge out all unwanted residual hydrocarbons, leaving the pure cannabis oil that is sold to medical patients & recreational customers across the state of Colorado. We offer a variety of different consistencies and types of concentrated cannabis oil. THE MOST FRAGRANT AND POTENT OF ALL CONCENTRATES, TERP DIAMONDS ARE CREATED FROM FRESH FROZEN PLANT MATERIAL AND PROCESSED WITH THE HIGHEST OF QUALITY CONTROL STANDARDS IN MIND. THIS PRODUCT IS REALLY TWO PRODUCTS IN ONE; THCa IS ISOLATED FROM THE EXTRACT TO CREATE LARGE CRYSTALS, AND THEN A HIGH TERPENE FRACTION IS DRIZZLED OVER THE TOP OF THE CRYSTALS RESULTING IN A HEAVY HITTING CONCENTRATE THAT ALSO PACKS A FLAVORFUL PUNCH. A GRANULATED SUGAR EXTRACT WITH A GOLD, YELLOW COLORING – LIVE RESIN IS MADE USING FRESHLY HARVESTED WHOLE PLANTS THAT ARE FLASH FROZEN. KEEPING IT IN THIS STATE THROUGHOUT THE EXTRACTION PROCESS RETAINS THE VALUABLE TERPENE PROFILE, FLAVOR, AROMA, AND OVERALL EXPERIENCE. LIVE RESIN IS ONE OF THE NEWER CONCENTRATE PRODUCTS ON THE MARKET. WITH A GRANULATED SUGAR OR WET SAND TEXTURE, AND GOLD AND AMBER IN COLOR - SUGAR WAX IS CREATED THROUGH A SPECIFIC SOLVENT MIX AND PURGING PROCESS, SLIGHTLY DIFFERENT FROM SHATTER OR BATTER. THIS CONSISTENCY ALLOWS THE TERPENE PROFILE TO PERMEATE THROUGH THE EXTRACT RELEASING THE STRAINS VIBRANT SMELLS AND FLAVORS. 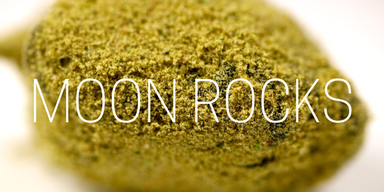 coined 'the strongest weed in the world", moon rocks are created by taking a nug of quality flower, dipping it in premium hash oil, and them sprinkling it with a layer of kief. this process repeats itself creating a thick impressive multi-layered "rock" of MARIJUANA. OFTEN A THIN, AMBER-GOLD COLORED EXTRACT – SHATTER IS CREATED BY PURGING OUT ALL OF THE HYDROCARBON SOLVENTS. YOU ARE THEN LEFT WITH A TRANSLUCENT CONCENTRATE THAT IS STABLE TO THE TOUCH LIKE A PANE OF GLASS AND CAN EASILY BREAK INTO PIECES - HENCE THE NAME. OF VARYING CONSISTENCY DEPENDING ON THE TERPENE POTENCY AND A BLONDISH GOLD COLORING – WAX IS CREATED SIMILAR TO SUGAR WAX AND WHIPPED INTO ITS FINAL TEXTURE. SLIGHTLY MORE AROMATIC THAN SHATTER, IT CAN ALSO BE THE LIGHTEST IN COLOR FOUND IN CONCENTRATES.